Your hand will contain nine cards based on the Periodic Table of Elements, and you will allocate them into three melds of words, straights, 3-of-a-family, and 3-of-a-period (hundreds of possible melds), presenting a challenging puzzle in every deal. In every meld, the strongest wins and eliminates the others, then the weakest of those (which already won one point) gets another point. The phases of a round. 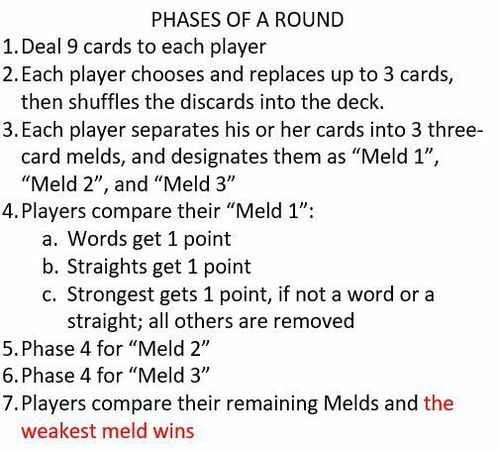 An important strategy of the game is allocating the nine cards into three melds that will get the most points: players want middling melds: strong enough to win the meld (since others are removed), but weak enough to win the round. I posted some comments on your rules in Dropbox. I like the game and the theme is fun! I found this phase summary more confusing than the one in the full rules, in particular the "Weakest meld wins" line at the end was confusing in the context of skimming the complete rules. Also I would write "Strongest earns 1 point, if not a straight or word. All others are removed." The semicolon made me think the removal of the other melds was conditional on the strongest meld not being a straight or word. Have you considered increasing the point value for having the weakest meld at the end? Since its worth the same amount as winning a meld it doesn't necessarily seem worth the risk of playing a lower value meld. What is your rationale for requiring a higher point total to trigger the end of the game when playing with more players? There are only ever 4 points available each round so it seems harder to get more points when playing with more players rather than easier. Also it would be great to have the tie breakers for strength within meld categories on the reference cards. Alternatively every Tiebreaker could be lowest Card, which would be easier to remember and never require a second tie break but maybe isn't as fun.